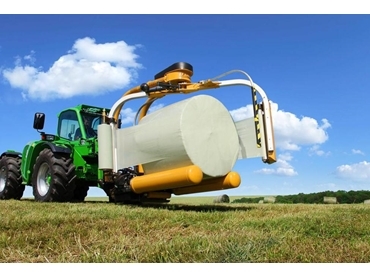 The latest addition to the 1300 series, 1320 round bale wrappers from FarmTech Machinery feature a unique patented twin folding wrap arm design and two independently driven rollers. The twin folding wrap arms on these round bale wrappers ensure that they maintain the compact dimensions of other models in the 1300 series, which is particularly important when they are used for wrapping and stacking. Evenly balanced to allow for high wrapping speeds, these twin wrap arms also eliminate the rocking motion associated with single arm machines. The two independent rollers used in 1320 series round bale wrappers provide for smooth and consistent rotation of bales while in operation, giving very fast loading and unloading times that are comparable to high speed bale wrappers. Self loading, these devices weigh only 700 kilograms, yet can process bales up to 1.5 metres in diameter, and 1,000 kilograms in weight.